Alfonso Ramón "Al" López (August 20, 1908 – October 30, 2005) was an American professional baseball player and manager. He played in Major League Baseball (MLB) as a catcher for the Brooklyn Robins/Dodgers, Boston Bees, Pittsburgh Pirates and Cleveland Indians between 1928 and 1947. He was a manager for the Cleveland Indians and Chicago White Sox from 1951 to 1965 and 1968 to 1969. His Spanish-American heritage and "gentlemanly nature" earned him the nickname "El Señor". As a player, López was a two-time All-Star and established a major league record for career games as a catcher (1,918). As a manager, his .584 career winning percentage ranks fourth in major league history among managers of at least 2000 games, behind Joe McCarthy (.615), Frank Selee (.598) and John McGraw (.586). His Cleveland Indians and Chicago White Sox teams were the only squads to interrupt the New York Yankees' string of American League pennants from 1949 to 1964, in 1954 and 1959, respectively. Over the course of 18 full seasons as a baseball manager (15 in the major leagues and 3 in the minors), his teams never finished with a losing record. He was inducted into the Baseball Hall of Fame in 1977. As a teenager, López took a job delivering Cuban bread door to door for La Joven Francesca Bakery, which was located in a building which later became the Ybor City State Museum. He had begun to follow baseball more seriously after his elder brother Emilio introduced him to the game as they followed the results of the 1920 World Series – which involved two of Lopez's future teams, Cleveland and Brooklyn. López later said that while his brother also had baseball talent, he himself was more driven to excel at the game. López's professional career began in 1924 when, at the age of 16, he signed on as a catcher with the Class-D Tampa Smokers of the Florida State League, quitting his job at the bakery and dropping out of high school at Sacred Heart College (later known as Jesuit High School). His starting salary with the Smokers was $150 per month, which was much needed by the large Lopez family during his father's illness. Soon after signing with the Smokers, Lopez impressed Hall of Fame pitcher Walter Johnson with his abilities during a winter barnstorming exhibition game. He moved steadily up the minor leagues ranks and made his major league debut in 1928 with Brooklyn. After splitting time between the major and minor leagues, Lopez became the Dodgers' regular starting catcher in 1930 at the age of 21 and remained a consistently dependable catcher for many subsequent seasons. Over a career which ran until 1947, he caught for the Dodgers (1928, 1930-1935), Boston Bees (1936-1940), Pittsburgh Pirates (1940-1946) and Cleveland Indians (1947). López's best offensive season was 1933, when he hit .301, stole 10 bases, and finished 10th in National League MVP voting. Overall, he compiled modest batting numbers, including 613 runs, 51 home runs, and 652 RBIs and a .261 batting average. He was better known for his defense and his ability to handle pitchers, which earned him two trips to the All-Star game and respect around the league. Hall of Fame umpire Bill Klem once ejected Lopez from a game just as it was getting started after Lopez pasted onto home plate a photo he had clipped from a newspaper, which showed Klem clearly in error calling a previous play in another game involving Lopez. The catcher had covered the photo with dirt and waited for Klem to brush off home plate and see the picture. In 1945, López surpassed Gabby Hartnett's major league record for career games as a catcher, and when he retired after the 1947 season, his major league record for games caught stood at 1918. This record was not broken until 1987 by Bob Boone, and the National League record was broken by Gary Carter in 1990. He caught 117 shutouts during his career, ranking him 13th all-time among major league catchers. In 1948, López began his managing career in the minor leagues with the Indianapolis Indians, the Pittsburgh Pirates's Class AAA affiliate. He spent three years in Indianapolis, leading his squads to one first place and two second-place finishes in the American Association while serving as the team's backup catcher. By September 1950, López had re-signed with the Indianapolis Indians for the largest salary of any manager in American Association history. His contract allowed for him to leave for any major league managerial opportunity. López was hired as the new manager of the Cleveland Indians in 1951. The Indians won over 90 games each season from 1951 to 1953, but came in second to the New York Yankees each year. In 1954, Lopez's squad won a then-American League record 111 games to capture the AL pennant, but were swept by Willie Mays and the New York Giants in the 1954 World Series in one of the biggest upsets in Series history. In 1955 and 1956, Lopez's Indians again finished in second place behind the Yankees. Lopez was "incensed" that Cleveland fans repeatedly booed Indians third baseman Al Rosen during the stretch run of the 1956 season and felt that team management did not properly support his injured player, leading Lopez to resign on the last day of the season. Lopez finished his Indians career with a record of 570 wins and 354 losses, and his .617 winning percentage is still the best in franchise history. Lopez agreed to become the new manager of the Chicago White Sox about a month after resigning in Cleveland. The White Sox did not have the power hitters of Lopez's Cleveland teams, but they had more speed with players such as Nellie Fox, Minnie Miñoso and Luis Aparicio. Consequently, Lopez changed his offensive strategy to fit the roster. The White Sox stole over 100 bases every season from 1957 to 1961, consistently leading the American League in that category and often almost doubling the total of the next highest team, earning them the nickname "Go-Go Sox". Chicago won 90 games and finished in second place behind the Yankees in 1957 while Lopez's old team, the Indians, suffered through a losing season. Chicago again finished second in 1958, but finally broke through and won the American League pennant in 1959, losing to the Los Angeles Dodgers in the World Series. By this time, Lopez was very well respected and in-demand manager, and in the middle of the 1960 season, a friend of New York Yankees president Dan Topping told an Associated Press reporter that López would replace Yankees manager Casey Stengel. (Stengel had managed López years earlier when López was a catcher for Brooklyn and Boston.) Despite the rumors and inquiries from other teams, López stayed with Chicago until 1965, finishing in second place five times and never posting fewer than 82 victories. 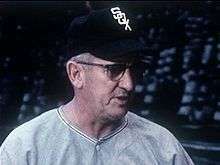 López retired to the White Sox front office after the 1965 season due to a chronic stomach condition and assumed the title of team vice president. He returned to managing in July 1968, when White Sox manager Eddie Stanky was fired. Lopez was able to get most of his former coaches to return to the team. However, he had to undergo an appendectomy shortly after taking over as manager and missed most of the rest of that season. He returned to manage the White Sox in 1969, but continuing health issues forced him to retire for good in May 1969. Describing Lopez and his managerial style, a 1957 Sports Illustrated piece said, "For Lopez, managing is a constant worry, a nervous strain, a jittery agony. Some managers thus beset relieve the harrowing pressure by exploding in sudden rages at players and sportswriters, or else by maintaining an almost sphinx-like silence in an effort to remain calm. But Lopez is a gentleman — a decent, thoughtful, exceptionally courteous man. He seldom permits himself the luxury of a temper tantrum, and he talks to anyone who talks to him." Lopez's .584 winning percentage is 9th all time in Major League Baseball history. At the time of his retirement, his 1,410 MLB managerial wins ranked 11th all-time, and were the 26th most wins as of the end of the 2016 season. In 18 full seasons as a minor league and major league manager, he never had a losing record. His 1954 Indians and 1959 White Sox teams were the only non-Yankee clubs to win the AL pennant between 1949 and 1964 inclusive, and his 840 wins with the White Sox still rank second in franchise history, behind Jimmy Dykes (899). Upon retiring from baseball in 1970, Lopez returned to Tampa to live near family and friends. He died there on October 30, 2005 at the age of 97 after suffering a heart attack at his son's home. His death came just four days after the White Sox won the 2005 World Series, their first championship in 88 years and their first pennant-winning season since Lopez had led them to the World Series in 1959. At the time of his death, Lopez was the last living person who had played major league baseball during the 1920s. Lopez was also the longest-lived member of the Baseball Hall of Fame, until Bobby Doerr passed him on June 18, 2015. López was the first Tampa native to reach the major leagues, the first to manage a major league team, the first to lead his team to the World Series (the others being Lou Piniella and Tony La Russa), and the first to be inducted into the Baseball Hall of Fame. As such, he has been the recipient of many honors in his hometown. When the city of Tampa built a new minor league and spring training ballpark for the White Sox in 1954, it was named Al Lopez Field in his honor. Later in life, López would recall a spring training incident in which an umpire with whom he was arguing threatened to throw him out of a game there. "You can't throw me out of this ballpark", protested Lopez, "This is my ballpark – Al Lopez Field!" The umpire ejected him anyway, causing Lopez to exclaim, "He threw me out of my own ballpark!" 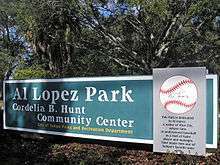 An aging Al López Field was razed in 1989, so Tampa rechristened Horizon Park, a city park a few blocks north of the old ballpark, as Al Lopez Park and installed a statue of López in his catching gear on the grounds. His high school, Jesuit High School, which is located across the street from Al Lopez Park, named its athletic center in Lopez's honor. López served as the AL's honorary team captain in the 1990 Major League Baseball All-Star Game. When the expansion Tampa Bay Devil Rays began play in 1998 in nearby St. Petersburg, Lopez was invited to throw the ceremonial first pitch. The Rays award the "Al Lopez Award" to the "most outstanding rookie" in the team's spring camp each year. 1 2 George, Justin. He was 'pride of Tampa Latinos'. Tampa Bay Times. November 1, 2005. Accessed August 22, 2013. 1 2 3 Al Lopez, a Hall of Fame Manager, is Dead at 97. The New York Times. Octobrt 31, 2005. Accessed August 22, 2013. 1 2 3 Al Lopez, A Legend. Tampa Tribune. ↑ "The Encyclopedia of Catchers - Trivia December 2010 - Career Shutouts Caught". The Encyclopedia of Baseball Catchers. Retrieved 29 December 2015. ↑ "Al Lopez signed again as chief". Palm Beach Post. September 22, 1950. Retrieved November 8, 2014. 1 2 "Tampa's Lopez named to manage White Sox". St. Petersburg Times. 30 October 1957. Retrieved 29 December 2015. 1 2 3 4 "Al López". Baseball Reference. Sports Reference. Retrieved October 24, 2015. ↑ Eck, Frank (August 7, 1960). "Eck sees Al Lopez as next pilot of Yanks". Reading Eagle. Retrieved November 8, 2014. ↑ "Lopez, Al". Baseball Hall of Fame. Retrieved November 1, 2014. ↑ "Al Lopez resigns managerial post with Chicago White Sox". Ellensburg Daily Record. November 5, 1965. Retrieved November 8, 2014. ↑ "Al Lopez resigns". Ocala Star-Banner. May 4, 1969. Retrieved November 8, 2014. ↑ Creamer, Robert (July 1, 1957). "The Good Days And The Bad Days Of Al Lopez". Sports Illustrated. Retrieved August 22, 2013. ↑ Hall of Famer Lopez passes at 97. MLB.com. Accessed August 22, 2013. ↑ The Tiger Tradition. Jesuit High School. Accessed August 22, 2013. ↑ Basse, Craig (October 31, 2005). "Baseball legend Lopez dies". St. Petersburg Times. Retrieved November 1, 2014. ↑ Morel, Laura C. Al Lopez house moves to Ybor City for new life as museum. Tampa Bay Times. May 16, 2013. Accessed August 22, 2013.